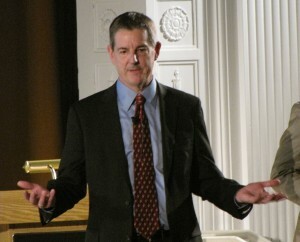 David Suomi of the FAA spoke with the audience. Photo by Wendi Dunlap. 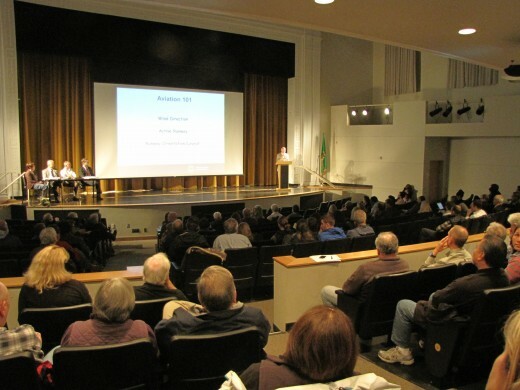 About 100 people from Beacon Hill and other neighborhoods came to Cleveland High School on Tuesday night for a meeting hosted by the Federal Aviation Administration (FAA) and the Port of Seattle, but the meeting did not go as planned. The Port and FAA intended the meeting to “provide information on existing flight procedures into and out of Seattle-Tacoma International Airport and Boeing Field,” and started the evening with an introductory “Aviation 101” slide presentation. The crowd had other ideas. Previously, the FAA had been criticized by some for the strictness of their meetings in Ballard and Federal Way, when residents were not given an opportunity to ask questions. This time, it was clear that they intended to let people ask questions, and ask they did. During the presentation, people in the audience frequently broke in with shouted questions to ask about the topic that most were there for: airplane noise over Beacon Hill and other communities under the Sea-Tac flight path. There was no printed agenda available, so the neighbors in attendance were restless, and in no mood to wait through presentations to get a turn to speak. The Port and FAA representatives would not commit to installation of more noise monitors on Beacon Hill, but promised to take residents’ concerns seriously. Some neighbors were skeptical. The crowd listening in the Cleveland High School auditorium. Photo by Wendi Dunlap. @beaconhillblog Someone should file a public records request for all e-mails related to the meeting to see what their real opinion is. again you guys don’t like it go to the issaquah highlands. this is a working community. Monster, there were folks at that meeting who have lived on Beacon Hill for more than half a century. I am sure they know the Hill just as well as you do, and their opinion is that the noise has gotten much worse lately. Obviously, not everyone agrees –but people can disagree on this issue without being evil gentrifiers who should move to Issaquah. The take-away message is this: The airline industry has ‘fixed’ the laws of the United States in their favor. As the FDA is under the influence of ‘big pharma’, so too the FAA is under the thumb of the major air carriers. A big THANK YOU to Wendi Dunlap for her great coverage of this important event! During the meeting it was said by the FAA that their number one goal is to get the airplanes lined up and landed as quickly and as safely as possible. That is their #1 job. Putting the FAA in charge of noise monitoring, abatement and environmental studies is a case of “the fox is watching the hen house”. It is not by choice the FAA runs these programs. Other than safety it is not their job to care about the well-being of residents. It is useless to try to work with the FAA. Pressure should be placed on our government representatives, whose job it is to care about their communities. Regarding the change in noise levels, I have lived on the same street since ’97. My house is 4 miles from downtown, I see the skyscrapers from my front yard, I do not live near the airport, yet there is constant air traffic. The flights have gotten lower and more frequent. A plane passes over my house every 110 to 45 seconds, which means if I’m lucky I may get 5 seconds of silence. Once the Greener skies program is fully implemented I will lose any silence I once had and the noise will increase making living in my community intolerable. Flight paths that use to go over other neighborhoods will be redirected over downtown and straight over the beacon hill neighborhood. Mil Gracias! 1000 Thank you’s to the folks that are pushing the FAA and the airlines on this. Last summer was the worst ever. It’s about time they took this neighborhood seriously.